Facebook has provided people and businesses with the tools to easily publish ads, "boost posts" and sponsored posts, we call this "one touch" advertisements. These tools, while simple to use, do not generate the type of results (leads and revenue) that a well managed sales funnel (or drip campaign) will offer. One touch advertising is effective for brand building and engagement but unfortunately has proven to be not so effective with lead generation and social selling. Enter the social media "Sales Funnel", one of the latest buzzwords in social media. Finding someone to explain what exactly is a sales funnel can be a challenge, finding someone to explain this in terms of social media can be even more challenging. Simply stated, a social media sales funnels are prescribed pieces of branded content that are presented to consumers in a logical sequence to nurture consumers from interest, to capture, to engagement and finally to conversion. Advertising Cost Savings - Yes, in both the short and long term you will realize a reduction in costs (primarily w/retargeting). Time Savings - Sales funnel ads are published as "dark posts"that run autonomously without the need of publishing new ads, they can can actually run in perpetuity if performing properly! Generating Leads and Revenue - The primary goal of a funnel is LEADS! While "likes" and "shares" might be cool they are not very good for lead generation. Peace of Mind - If you are anything like many others, the fear of missing out on opportunity is a problem. A properly implemented sales funnel (or drip campaign) will ease your conscience that your brand is in front of every possible prospect! The first step for beginning your Facebook Video Sales Funnel and Drip Campaign ad strategy is the creation of 3 videos. 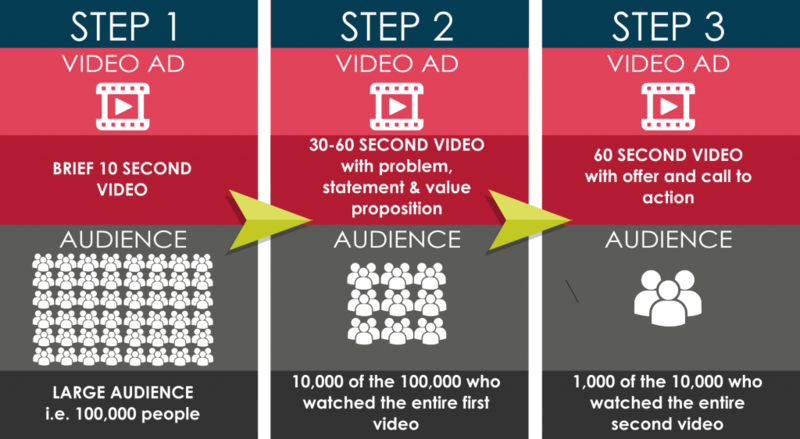 Each video, or step, is carefully crafted using conventional sales techniques; 1) Crafting a problem statement consistent that is aligned with the needs of your audience, 2) A value proposition that addresses the problem statement and 3) Call to action with an value-offer to solve the problem and is consistent with internet and social media best practices . The scripts are crucial however as crucial as they are, just as important as the script is the duration of each video. For each video to be effective, the first 3 seconds are critical to capture attention while the remainder of the video content needs to deliver a powerful message, playing on emotions and buying motives. On day 2 we will focus on how to upload videos in the background on Facebook. Once the videos are uploaded, we will demonstrate the CRITICAL task of how to monitor viewership of each video. Remember, consumers will only see Video 2 after completing a percentage of the Video 1 (we recommend 75% or 95%) and subsequently only see Video 3 after viewing Video 2. Save Money - Once the funnel is running, you will only be paying for video views of audiences you captured! On day 3, we will provide video instruction with step-by-step instructions how to create the campaign, ad sets (3 of them) and ads (3 of them). After we review the ads and make sure that we have a 2nd person to proof-read and check for quality you are ready to launch! On day 4 the conversation will be about reporting and analyzing data. We will provide a video tutorial with instructions how to review the data, which data points to observe and which data points to ignore. Proactive data monitoring will decrease your Facebook ad spend over the long haul while ensuring that you are routinely capturing fresh leads. DON'T MISS DAY 2, CLICK HERE TO REGISTER + GET FREE FACEBOOK LIVE CHECKLIST! 1DO I NEED TO HAVE 3 STEPS? Absolutely not, there are cases where 1 or 2 is plenty, you will get optins on the first step. Some industries (i.e. real estate) with longer lead times require many more steps than 3. The purpose of 3 steps is to maximize your chances of winning, when a consumer is ready to shop insurance the purchasing decision is pretty immediate and the buying motives are strong. 2WHAT KIND OF BUDGET IS TYPICALLY REQUIRED? GREAT QUESTION! Our recommendation is to run Step 1 between $10-20 per day for the first month, Step 2 at $3.00 per day and Step 3 at $2.00 per day for a total of $15-25 per day for the first month. This should start generating leads within the first few days. After 2-4 weeks of data and reports are available, decisions will need to be made whether to increase or decrease budget and if you are really knock it out of the part, then add additional funnels! 3HOW DOES 3V BENEFIT FROM GIVING US THIS INFORMATION? We offer training, consulting and service offerings. Truth be told, many people who want to implement a sales funnel are smart enough to put the execution into the hands of professionals. Our training and consulting offerings are great for agents, teams of agents and even wholesalers since we are capable of training agents, brokers and other like minded marketers! 4HOW DO I LEARN MORE ABOUT FACEBOOK SALES FUNNELS? There is a lot of great content on the 3V site and throughout the internet. Facebook sales funnels is a very popular topic. What differentiates us (3V) from others is our focus on strategically integrating video (including live video, Facebook Live) into the sales funnel process. Contact us for a free consultation and we will be glad to answer any questions you may have.